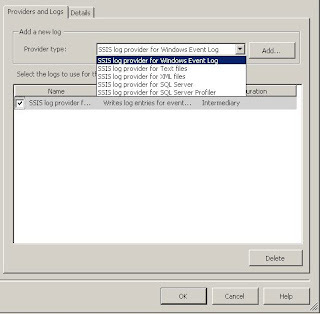 For my project I choose the SSIS log provider for SQL Server, Once this is done check the box next to the option SSIS log provider for SQL Server, then choose the database connection where the logging will happen, when SSIS package runs it creates a table called sysssislog. In the details tab, choose the Events that need to be tracked, look at the figure below for reference. Once this is done, click the OK button, Logging is now enabled for the SSIS package. Once the package is executed, look for the table sysssislog in the System databases under the database which was chosen in the Configuration column in the Provider and Logs tab. The sysssislog table has columns called source (contains the name of each task which is executed), message which contains more detailed message about the task,event (which contains the event that were chosen to be audited). The table also has columns called starttime and endtime which indicates the start and end time of each task. 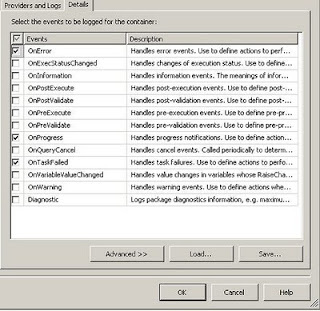 To summarise, using the Logging option in SSIS, one can audit SSIS packages very effectively. @anonymous: I have done a spell check and removed the spelling mistakes except for the Keywords like SSIS,ETL and sql. thanks for the article. it is good. The table is available in the msdb database. Can i rename dbo.sysssislog ?